Upon my 21st birthday I went on a month-long solo European vacation. One of the first places I went to was Notre Dame. When I got there I was told that earlier that morning someone had jumped off the roof. Did it close? No. In fact church went on like it had since the 12th century. Something tells me they will rebuild, improve it tastefully, and celebrate life and loss as only the French can. we gave em mcdonalds, spaghetti-o’s, 3D movies, and I Can’t Believe It’s Not Butter, but somehow chlorine – which sounds french – didnt make it on the boat. even then i felt old. but for that week all was right. we all got on planes and jetted over seas in the summer to party hearty. everythings more perfect than we think. a melancholy synth driven curiosity reportedly about two lovers trying to kick heroin. and there you are godhead. the people of france think i was the editor of the daily nexus. i said thats because you dont realize where you are. i said we are in the 18th century, Pareee France. which in french is QUOI! QUOI! they didnt have twitter back then! my niece, pictured, interrupts. au contraire, they had little birds that they stuck numbers to. a Zero meant non, and a 1 meant oui. Marie was a big fan of Napoleon because she liked to feel tall and thought points in the paint were overrated. so they held hands and were suddenly married. Napoleon took over much of the world (aka Europe) but bogarted the booty his armies plundered and France was starving avec le Marvin. OMG LIKE IN LES MISERABLES? she said. and I pounded my fist on the table and said OUI! and someone came to Kirsten Dunst and said, the busblog loves you. and Kirsten said, omg tell the busblog i love him right back times a million. a dove was released with the number 1 on its back but napoleon was playing real life Duck Hunt at the time and shot it down. Let them eat cake, Marie Antoinette said. THATS NOT TRUE, my otherwise quiet nephew said. That’s from Peabody and Sherman. he speaks very quietly so i had to have him repeat it several times, and it turns out that “literally the first words in the film Mr. Peabody and Sherman” used Kirsten’s line and confused the shy lad. i assured him that it was my girlfriend who said it thus the Rocky and Bullwinkle spin off recycled the line. and i said, do you know what we built for them as a thank you? and a french mime walked past and threw down his beret in disgust because i was so wrong about so much of the story but i built an invisible box in which he is still trapped and now we are living happily ever after. how often do you go to france? especially the center of france? a place that has white chocolate cows with creamy nougat in the middle? how often do your friends get married in a castle? dressed like buddy holly wearing a yellow chuck berry jacket? to a classy chic french woman like none youve ever met before? in the middle of summer, and then take la gare to a town that no one seems to have heard of. and they disappear into the air when the idea of a week long european party with your amigos is presented to you. a trip you’ll never forget ever, a wedding so beautiful that every single part of it was beautiful. including this little story about the bride’s family. an adorable village that Parisians would escape to when they wanted to “holiday” (aka drink). one day the family was voted out of office and they were so sad. soon the nazis showed up, for it was the 1940s and thats what nazis did to lots of french towns back then. and the nazis said take us to your leader. and the people pointed to the new leader who had recently won the election. and the nazis took the new leaders to a nearby barn and set the barn on fire. eventually the nazis were defeated and emannuelle’s family was restored to their role of leadership. where they sit to this very day. the lesson here is, to me, dont freak out when things dont go your way. they might be totally going your way in the big picture. matt and emmanuelle had such a glorious wedding that we didnt even need to eat or drink afterwards because our souls were nourished just being there. we drank anyways to appease the locals and went to bed not realizing we were sleeping in magical french barns. everyone but anna sang afterwards. i think she just wanted to listen. oh yeah a castle was involved. forgot how though. this is one of about five of my friends’ weddings that id sure love to tivo one day when thats available. 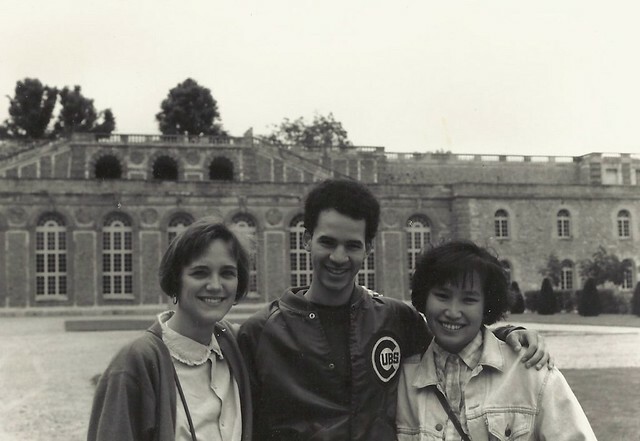 I also had the strange ability of meeting people on busses in Iowa, becoming pen pals, and then visiting them in Switzerland where they would introduce me to their Korean roommates of whom I would discover what it was like to experience love at first sight. Never have I told the story of Ae and our unrequited passion and how it brewed at Versailles and later in Paris and in Lausanne. But someone sent me this photo and it reminded me of all of those feelings. Including the weirdness that I used black & white film back in the day. tons of people were there. it was in the middle of france in a summer vacation town called joncy. white cows walked right down the middle of the street speaking french. first me and chris flew into amsterdam and decompressed there for a few days. everyone says that traveling to europe in the summer is so expensive and uncomfortable and crowded and terrible but in the middle of july all the dutch take their vacations and head to greece or the south of france or anaheim so my favorite european town was nearly empty and strange. it was raining a little too. didn’t matter. if anything it made it better. even though our marriott had a pizza hut underneath it, it wasn’t what id consider amsterdamian, so i dont recommend it. after a few days we took a train to my second favorite european town, paris. paris was cool. by the time we got there though the only restaurant open was one of those chic ones where you eat on the outside in front of the restaurant judging people who walk on the sidewalk. i think all they had left was lobster and shrimp and tasty wine and strawberries and chocolat mousee. after a romantic stroll free of parisians who were also in greece, we retreated to our filthy room with charming view and agreed that even the dirtiest of streets of paris are still much more magical than the best streets of the mission of frisco where we were living at the time, happily. only scary part about paris was the fact that no one knew where joncy was. it may have had to something to do with my special brand of french. i’ll tell you why, because as long as americans have been coming to europe we have been asking for cold cokes. if europeans wanted spit on their waffles, after a while we would just know to include spit on your waffles when you came over here. me and chris were drinking wine everywhere we went even on the train to mont pilleir or whatever the town was that dougie gyro and barney picked us up at, but we were pretty drunk when we showed up and we met up with our friends and tick tock it dont stop. we were driven to grandma’s house, emmanuelle’s grandma. everyone has castles in this town. the white cows demanded it. grandma’s castle was pretty nice, but her barn was the best so we all slept there. it was hot in joncy and the windows were open and people were playing guitars and singing songs. all of my friends play and sing except me. i drink and smoke and fall asleep. aaaaahhhhh. in the morning we walked into town. first we crammed into the mayor’s office. emmanuelle’s dad is the mayor. everyone was smiling and talking french and then the mayor said some things in english and pat whalen was the best man and he was laughing so i kept laughing. then we all walked down the main street of joncy a beautiful parade. matt had on this crazy yellow jacket looking like buddy hollys cousin in law some guy was playing a violin, layne was playing the guitar. people were singing. made it to the church and that was entirely in french and way better than most services that ive been to. probably cuz it wasn’t full of lies. after church we went to the pre reception drink off at a nearby school. only a few of us knew it was a drink off so i placed pretty high. piled into cars and drove out of joncy to where the mayor lives. his castle was the best one. three stories, big, yet homey. in the backyard were several big tents where we would eat and drink and dance into the wee hours. the camps were equally divided between emmanuelles euro friends and matts dirty american pals. the girls were beautiful intellects on both sides but the menfolk from matts side were decidedly scruffy and crude, like moi, especially with the neverending barrels of wine that grew from the trees of the countryside of west joncy. layne kissed matts teenage sister. a fight broke out. it was settled with a highly entertaining breakdance battle. ken had to kiss matt. then everyone kissed everyone. then dougie gyro hijacked the wheels of steel and we danced til the dawns early light. rode cows to grandmas castle barn, hit the hay, and have yet to wake from that beautiful dream.